Japan is well known for their etiquette. If you plan on traveling there it’s important to learn a little about their culture so you fit right in and don’t come off rude. One question we are asked often is the correct way to make a toast and say cheers in different languages. In this post we talk about the proper way to say cheers in Japanese and the meaning behind it. The English version is Kanpai (乾杯!). The meaning behind this is’dry the glass’ which is in reference to the English meaning of bottoms up. In Japan it’s proper to make a toast using Kanpai before starting to drink. Otherwise you are being rude and disrespectful which the Japanese are not found of. You can use Kanpai before any alcoholic drink such as beer, wine, and cocktails. This doesn’t mean you have to actually go bottoms up and drink your entire glass. After a cheers in Japanese it’s better to drink it like you would normally do. If you are on a business trip, you may also hear Otsukare-sama desu (おつかれさまです) after work as it literally means ‘good work today’ and is the more proper way to toast instead of Kanpai. Japan holds high regards for their senior citizens so typically the eldest person in the group should make the toast. It’s respectful to wait to start drinking until cheers has been made followed by any bows and touching glasses. This would be very similar to how you would cheers with your friends, but it’s just more commonly used in Japan. Once the cheers is over you typically want to have one hand on the glass and the other hand beneath it. If you are good friends with the group you can get away with just using one hand, but on business trips or with strangers, be sure to use both hands for respect. 1. Getting rid of demons – During the middle ages, alcohol was thought to have evil spirits and anyone that drank would be cursed. People started to cheers and touch glasses in order to make sure their drinks were rid of demons. The clanging noise was suppose to scare the evil spirits away. 2. Poison control – This one may sound crazy, but in ancient Rome there were always people trying to kill one another by poison. It soon caught on to cheers and toast one another in order to try and spill some of their wine into the other glass. If that person started to drink their alcohol you would know the drinks were safe. As we get back on track, the Japanese started toasting and saying cheers around the 1850’s. When England and Japan made a treaty, the British carried over toasting one another and it quickly caught on. Kanpai grew throughout the country and these days is still widely used between good friends and family. If you’re in Japan and find yourself at a bar or party, it’s good to know the correct rules before you lift the glass to your lips. At a business meeting either the 3rd highest person at the company or CEO will make the Kanpai cheers and typically has a very quick speech. Make sure you don’t toast with water as that is only customary for those who have died. It’s to make sure as one passes on, they aren’t thirsty in the afterlife. Unfortunately you must wait to have a drink until someone makes the toast. Drinking prior is considered very rude in Japan. 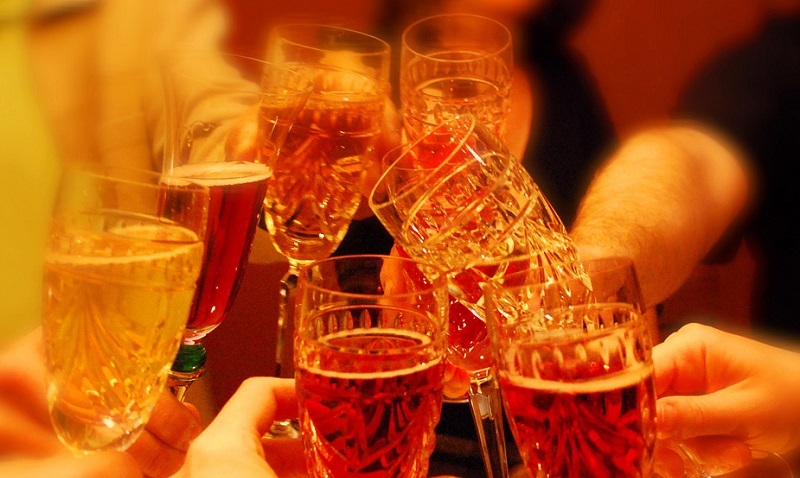 A toast typically only occurs once before the party gets started. However, if someone of important arrives people will often make a second or third cheers to welcome them to the group. Every country has a different saying and cultural significant meaning the word Cheers. Be sure to do a little research so you don’t get caught off guard. Kanpai! Other than Kanpai, another toast you can give is Banzai! This is usually used in more festive setting and means “live 10,000 years”. Although it may not really make sense, it’s still used quite often and will make most locals around you raise their glass as well in excitement. I mean, who really doesn’t want to live that long so make sure you shot out if someone says Banzai! The third cheers is Omedetou meaning “congratulations”. This toast isn’t used too often unless it’s at an event like a birthday or wedding. The fourth way to say cheers for those upper class events is otsukaresama deshita. The meaning of this phrase is “you’re tired” which might sound odd, but the Japanese respect a good days work and saying that is a big complement as it means the person you are toasting deserves a drink for working so hard. We doubt you will really hear this while on Vacation (as you probably aren’t working), but if you see a Japanese business man and say otsukaresama deshita, they will surely smile an raise their glass. The two choices in Japan when making a toast will be Sake or Beer. For the first round of drinks everyone typically will drink the same drink. More often than not it will be beer, but respect the local traditions and try to order what everyone else is having. This is only a rule for the first drink.